The cold and dark winter months are finally upon us, so in the spirit of all things bleak and Scandinavian, I decided to check out the exhibition Nordic Noir Art by Danish artists Carsten Krogstrup and Steen Larsen. The exhibition Nordic Noir Art displayed at Rundetårn in Copenhagen, showcases a selection of works by the Danish artists Carsten Krogstrup and Steen Larsen. This has resulted in a sensory experience of nostalgia that taps into the ever-growing fascination with Nordic Noir. 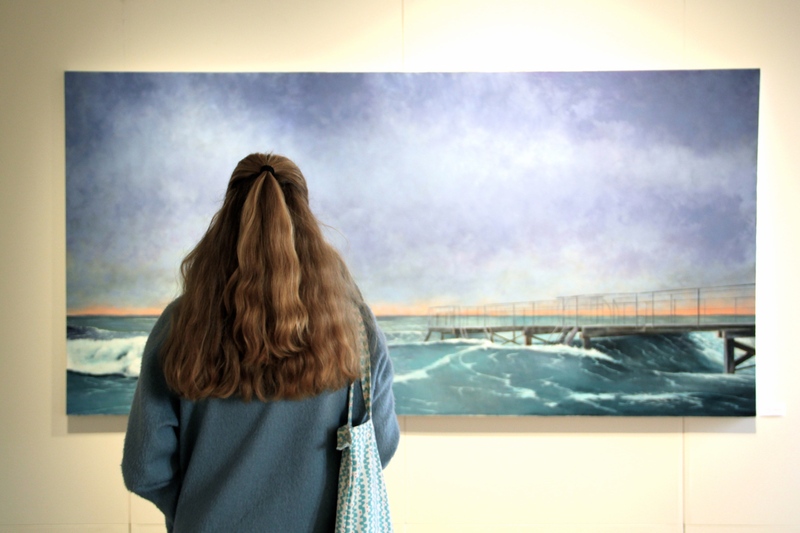 Their paintings are created in the style of Photorealism and they use oil on canvas to imitate the life-like quality of photography and film. Krogstrup uses the painting techniques of Photorealism to capture minute details, like the sunlight reflected in the metallic muzzle of a greyhound or the wrinkled, liver spotted hands of an elderly woman lying in a hospital bed. His observant use of light and shadow creates a dramatic effect that emphasises the realistic, yet mysterious, quality of his paintings. His depictions of sombre and unnerving scenarios are set against backgrounds of black and earthy tones, capturing the dark and moody atmosphere associated with the characteristic style of Nordic Noir. “Racing”, Oil on Canvas (2015). Carsten Krogstrup. In his series of paintings titled Submission, Krogstrup depicts a variety of scenarios exploring power and sexual dominance, represented by posed interactions between a man and a woman. Underlying tensions of exposure and vulnerability are contrasted with the piercing gaze of a half naked man, who is lying between a pair of female legs in black tights and high heels, as he solemnly looks out at the viewer. The painting challenges the division between the private and public sphere, whilst also expressing a feeling of detachment and uneasiness. Krogstrup’s images of Greyhounds racing against each other in the series titled Racing, captures a similar sense of apprehension and animalistic instinct, which is contrasted by their muzzles signifying domestication and submission. “Stacked”, Oil on canvas (2014). Carsten Krogstrup. 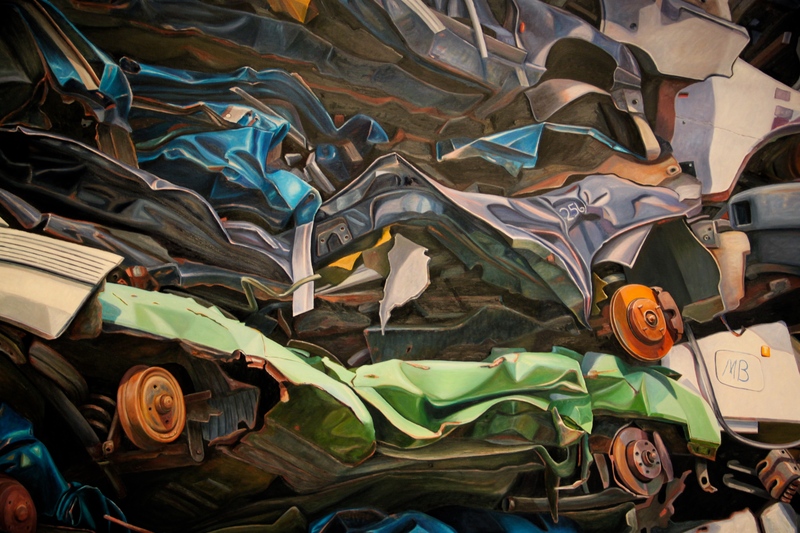 Images of scrap yards and rusty cars appear in several of Krogstrup’s paintings with titles like “Paradise Lost” and “Chaos”. The paintings convey a sense of abandonment, disintegration and dystopian hopelessness, which echoes the stripped-down representations of social realism found in the genre of Scandinavian crime fiction. Krogstrup also paints images of old cars abandoned in nature, as he depicts the passing of time with the rusty colour of their metal exterior, which slowly merges together with the earthy tones of their surroundings. In a video explaining the thoughts behind the artwork, he states that the paintings are centred around themes of mystery and melancholia, as well as the power of ‘the dark side of nature, as it arises and takes over’ (Krogstrup). Most people will probably be able to recall the feeling of sitting in the backseat of a car, while being lulled to sleep by the gentle hum of an engine and the repetitive sound of raindrops hitting a windscreen, as the world outside turns dusky. Steen Larsen, a realist painter and photographer from Denmark, uses images of cars and nature in his work, which consist of paintings, photographs and video installations. In Fire Generationer med Bil (Four Generations with a Car), Larsen’s painting is divided into two sections. One shows the vivid image of raindrops on a car window painted in the style of Photorealism; the other shows the idyllic depiction of a photograph taken of a family standing with their car in sunny surroundings. The combination of the subjects of family and nostalgia create a strong theme, which is evident throughout Larsen’s work. “Vester Allé”, Oil on Canvas. Steen Larsen. 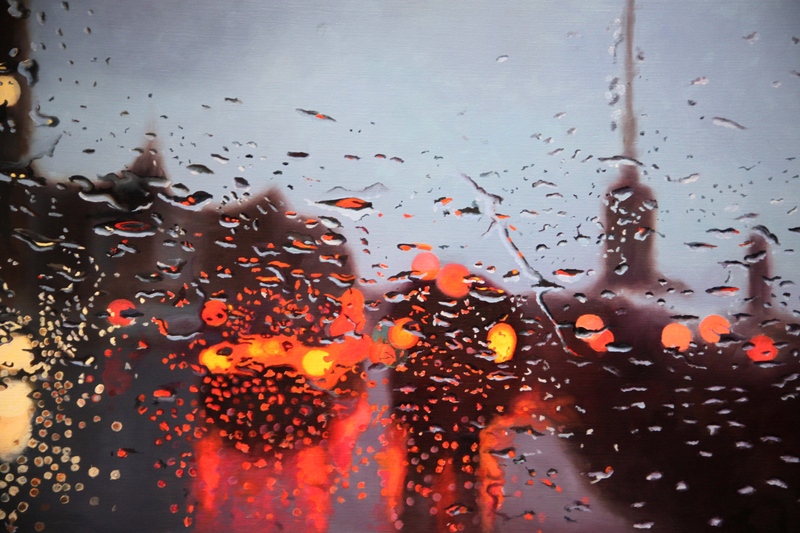 His paintings titled Rainscapes show the repeated image of raindrops on a car window set against the blurry backdrop of the reflected light from the surrounding traffic. The individual titles of the paintings, such as “Jyllands Allé,” “Bjerringbro by night,” “Tingskoven” and “Vester Allé,” reveal an awareness of familiarity that makes them inherently Scandinavian. Most people will probably be able to recall the feeling of sitting in the backseat of a car, while being lulled to sleep by the gentle hum of an engine and the repetitive sound of raindrops hitting a windscreen, as the world outside turns dusky. Larsen tries to evoke this sense of nostalgia with the blurry video clips shown in his video installation Road Noir. The video is accompanied by the eerie music of Emil Nissen, as it captures the atmosphere of the cold and dark elements of nature looming outside of a car window. I am trying to reconstruct my dad’s life in 12 black boxes, and investigate the connection between private and public memory. Larsen’s photo installation Days when the World stood still consists of 12 light boxes. They show a range of photographs depicting important historical events displayed alongside old slides from his own family albums. In the description of the art piece, he describes how his father was an air traffic controller at Copenhagen airport and how he is now suffering from dementia at the age of 84. “The Wave”, Oil on canvas (2015). Steen Larsen. In the description of the photo installation he states, ‘I am trying to reconstruct my dad’s life in 12 black boxes, and investigate the connection between private and public memory (…) I have pinpointed 12 dates and years that changed the world, starting with May 4th ,1945, when Denmark was liberated after World War II and my father was 11 years old. A date we will remember, but my father [will forget]’ (Larsen). The works of Larsen and Krogstrup explore different notions of the private and public sphere, whilst also experimenting with the idea of a personal- and collective memory. Their art contains elements of nostalgia and mystery, which creates a clash between Realism and the surreal. Overall, the exhibition manages to establish a distinct atmosphere associated with the characteristics of Nordic Noir, which will please the heart of any Scandinavian. Visit Rundetårn at Købmagergade 52A 1150 København K to check out their upcoming exhibitions.